The blurb on the back cover says this book is for nurses and other professionals in mental health practice, but the contents are clearly directed towards nursing students. While this book is an introductory text for the uninitiated, it is not without its good points. 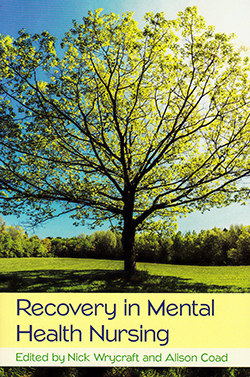 Primarily these are that it is a readable overview of the principles and practice of recovery-focused nursing. An overview is provided of the Tidal Model, Wellness Recovery Action Plan and Repper and Perkins’ psychosocial model, though anyone wanting more than the briefest of introductions would be better advised to go to the source materials. This is a book that a university library might usefully stock, but it isn’t the ‘exciting and essential read for professionals’ claimed on the back cover.